Novice programmers often find themselves overwhelmed when it comes to writing their own applications. Sometimes what they need is a blueprint – an example to follow that shows them the way. 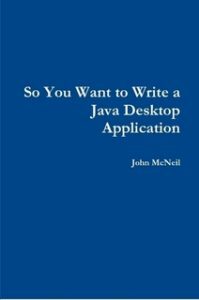 “So you want to write a Java application!” is written to do just that. It takes a simple description of an application and walks through how to build the program. So if you want to get to grips with how to produce your own applications then this book is written just for you. See what it takes to take an idea through to completion. When starting out on your journey to learn something new like Java it can be a little daunting. That’s how I felt in the beginning. There were so many things I wasn’t sure about like using streams, input and output, swing, awt and a host of others, that I wanted to know. So, for anyone looking to develop their Java programming skills and feeling the same way, I have put together some short tutorials demonstrating how to do certain things. I hope you can take these tutorials and include them in your own Java desktop applications. Each tutorial comes with a description to explain what the video is about. There is also the full project source code available to download if required so you can skip the typing and just follow along. Just go here to see the tutorials. One of the challenges when starting out with a new language is getting up to speed. Getting to a point where you have enough knowledge to start solving your own problems. That is why all the courses listed here are full working examples and demonstrate how to pull together a number of techniques into a complete application solution.